Many people are not Trump’s fan apparently! Just weeks after singer Pharrell warned the President from using any of his songs, Rihanna is also doing the same!Rihanna is now the latest artist to send a cease-and-desist letter to Donald Trump, with the singer deploying legal action after her “Don’t Stop the Music” was played at the president’s rally on Sunday in Chattanooga, Tennessee. “It has come to our attention that President Trump has utilized [Rihanna’s] musical compositions and master recordings, including her hit track ‘Don’t Stop the Music,’ in connection with a number of political events held across the United States,” Rihanna’s legal team wrote in a letter to Trump’s White House counsel. On Sunday, Rihanna learned that Trump had been using her music at rallies when Washington Post reporter Philip Rucker tweeted, “It’s been said a million times, but here’s a million and one — Trump’s rallies are unlike anything else in politics. 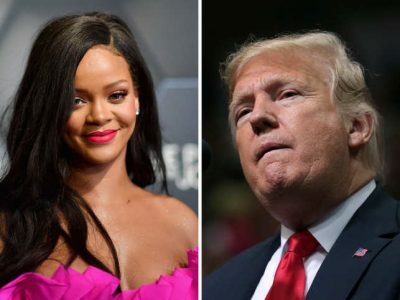 The next day, Rihanna officially took action against Trump, joining recent artists like Pharrell Williams, Steven Tyler and the Prince estate that have warned the Trump administration over their rallies’ playlists. Nobody likes Trump?